Mary was due to see Supertramp at the O2 with her friend Andrea but was unable to go so I stepped into the breach. 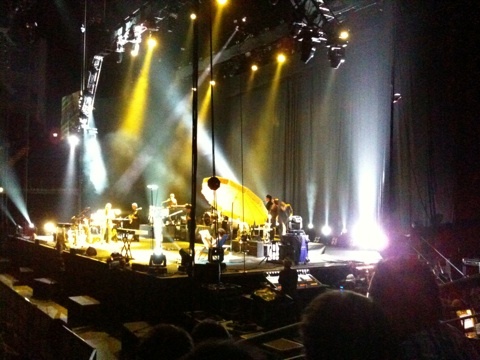 Andrea had managed to get excellent seats - the closest to the stage that I have ever been at the O2. Courtesy of my mobile service provider O2 I got us a free upgrade to access their O2 lounge and we were able to relax in uncrowded surroundings. If you are an O2 customer text 'upgrade' and the number of guests (max 4) to 60202 after 3pm on the day of the concert. If you are in the first 100 then you get access, 2-4-1 cocktails and a private elevator to the arena. The concert is part of Supertramps's "Greatest Hits Tour" and so it was. Excellent concert with much toe-tapping. Afterwards we went for a glass of wine while the crowds died down and got home about 00:45. I must say was not fully refreshed, alert and ready for my day when the alarm went off at 05:45 but worth it. In my opinion, Roger Hodgson was the heart and soul of Supertramp. I have seen Supertramp perform without him and even though it is said that he is not missed with Jesse Seibenberg singing his songs, the truth is that Jesse may sing the songs well but the true spirit, feeling and meaning of the songs he cannot truly convey. At Roger's concerts you will step into a real experience of the Supertramp hits that were penned by Roger. There is also such a feeling of Love and magic and openheartedness in the whole audience because that is who Roger is. If you want to just be a faceless face in the crowd, go see Supertramp If you want to feel special and connected to the songs and artist go see Roger.